According to the latest Chicken Wings Data we saw on the news (believe it or not this is according to The National Chicken Council), 1.25 billion chicken wings will be consumed on Super Bowl Sunday. Some people call them “Buffalo Wings”. I guess if you live in Buffalo, NY that’s what you call them. Enjoy the Game! 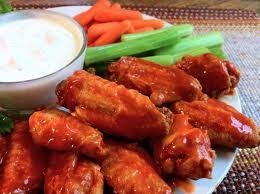 Don’t these wings look nom as hell? Go Red Wings, I mean Seahawks! OMAHA! This entry was posted on January 31st 2014 at 6:54pm/18:54 and is filed under Live News Column 1. You can follow any responses to this entry through the RSS 2.0 feed.